Cookie Chanel is a vintage clothing shop owner who has a last minute client needing costumes for a photo shoot at a cemetery. One dead body later and Cookie is deep into a mystery with an extra ghost, her boyfriend, a volatile relationship among suspects, and so much more. Book 7 is filled with fun times, nail biting moments, fabulous characters, and great dialogue. If reading the story out of order contained any great spoilers, I can only think of one and I didn't' find it to be anything that would keep me from reading previous books.Great tips for dressing and finding vintage, thought not for those who are plus size. Thank you to NetGalley, Rose Pressey, and Kensington Books for giving me the chance to read this book and share my honest thoughts and opinions with others. A solid paranormal cozy series. I found the characters entertaining and the whodunit was well written. I would have enjoyed it more if I had read the previous books in the series, which I will rectify. I voluntarily read an advance reader copy of the book. Always great tips especially if you are stuck here as a ghost. Interesting story filled with drama and action. Perfect cozy mystery. Love me some Cookie Chanel! Fashions Fade, Haunted is Eternal by Rose Pressey takes us back to Sugar Creek, Georgia. Cookie Chanel owns It’s Vintage, Y’All and has been hired by Tyler Fields, a photographer, to style models for a fashion shoot for the Halloween issue of Fashion & Style magazine. The shoot is taking place at a local cemetery where Tyler has been snappish all day and Cookie saw him get into an argument with a man who has been lingering in the background all day. Cookie is surprised when a ghost dressed in fashions from the 1920s appears next to her and her ghostly friend, Charlotte. Minnie Lynn is wearing the pearls that Cookie recently acquired at an estate sale. Before she can react to the spirit, a shot rings out which sends Cookie running towards the sound. A model runs past her stating the photographer is dead. Cookie finds Tyler lying next to a headstone and he has taken his last shot. Detective Dylan Valentine, Cookie’s boyfriend, arrives on the scene and Cookie fills him in on all the details. Dylan, thankfully, knows better than to warn Cookie not to delve into the case. Cookie is back at her shop when her friend Heather pops in. To their surprise, Heather can now see Charlotte and Minnie. Cookie’s first order of business is identifying the man that Tyler was arguing with at the cemetery. Krissy Dustin, one of the models from the shoot, is a talkative woman and provides a suspect in Tyler’s possessive ex-girlfriend. Cookie goes back to examine the crime scene in more detail and a helpful cat leads her to a clue. Cookie soon discovers that the cat is no ordinary feline. Cookie, with the help of her spirit friends, Grandma Pearl (aka Wind Song) and her new feline companion, sets out to dig up Tyler’s killer. 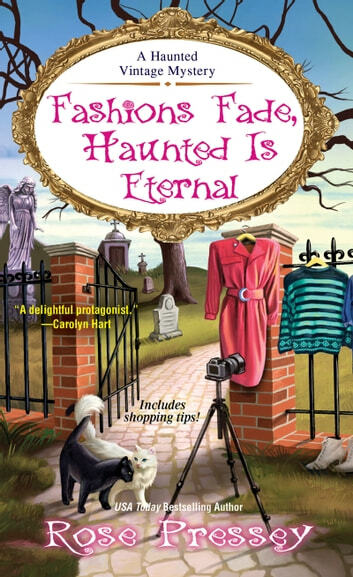 Fashions Fade, Haunted is Eternal is an entertaining and lighthearted cozy mystery. Cookie Chanel is a quirky young woman who dresses in vintage fashions plus drives a beautiful classic car. Her best friend, Heather Sweet, owns Magic Emporium which has helpful books for Cookie plus a Ouija board when Grandma Pearl needs to converse. Minnie Lynn was a fun addition to the book. The witty repartee between Minnie and Charlotte will have you in stitches. The way Cookie walks around town talking to the ghosts, I am surprised the whole town is not aware that she can see and talk with spirits. I like that Dylan is now aware of Cookie’s secret. Dylan Valentine is a good man and the perfect suitor for Cookie. He understands her and accepts her (does not want to change her). I like that nothing seems to phase Dylan. The mystery is straightforward and is a cinch to solve. Cookie goes around asking questions, listening in on conversations, and does a little catfishing to garner information. The ending is romantic and heartwarming (readers will love it). It was the perfect ending for Fashions Fade, Haunted is Eternal. Fashions Fade, Haunted is Eternal is the seventh book in A Haunted Vintage Mystery and it can be read alone. Rose Pressey has an engaging, casual writing style which makes her stories a pleasure to read. Her characters are likeable, and the setting is charming. The town is filled with friendly residents who understand and accept Cookie’s quirks. I am giving Fashions Fade, Haunted is Eternal 4 out of 5 stars (I liked it). 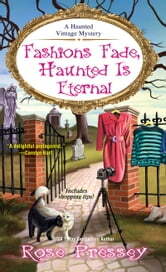 If you wish to read a lively and humorous cozy mystery, then look no further than Fashions Fade, Haunted is Eternal.